We, as parents, want the best for our children, but do we know what the best is? Without this knowledge, important nutritional elements could be lacking in our child’s body. The stomachs of all babies and toddlers are vulnerable. Knowing this, we have created Lactoflor Kids, which contains seven strains of probiotic bacteria, with proven extensive beneficial action. Lactoflor Kids is a synbiotic product that combines probiotics* with natural fibres (prebiotics). Lactoflor Kids supports the immune system, restores intestinal balance, and prevents penetration of viruses and development of pathogens in order for our children to be healthy. *Contains milk protein and lactose. One daily sachet of LactoFlor Kids for babies and children provides one billion beneficial bacteria which help maintain a healthy stomach, facilitate appropriate and wholesome digestion, and support the immune system. The specialised content of LactorFlor Kids comprises selected Bulgarian strains of Lactobacillus and Bifidobacterium, including probiotic properties enhanced with natural fibres (prebiotics). Administered to young children, these strains particularly help gastrointestinal problems and can also assist in forming a healthy mixture of intestinal bacteria in due course, as well as maintain lasting balance in the digestive system of babies over six months of age and young children. The intake of LactoFlor Kids also helps strengthen the immune system and is effective in remedying constipation, digestive disorders, and intestinal infections. It is also used for recovery after the use of antibiotics and for additional complaints. Lactoflor Kids contains seven strains of probiotic bacteria: four species of lactic acid bacteria (L.helveticus, L.acidophilus, L.bulgaricus, Str.thermophilus), combined with three strains of the beneficial Bifidobacterium (B. bifidum, B. infantis, B. Longum). Each type of probiotic microorganisms contained in LactoFlor Kids contributes to regulating gastrointestinal flora and improves children’s immunity. These bacteria strengthen the protective functions of children’s bodies by stimulating the immune and digestive systems. They suppress the development of pathogenic bacteria, alleviate lactose intolerance symptoms, and help prevent and stop diarrhea symptoms. It has been proved that they have a role in increasing the absorption of calcium, which is indispensable for the development and strengthening of young children’s bone systems. This is one of the most important probiotic microorganisms which normally colonise in the small intestines. They help maintain the good condition of the gastrointestinal tract during antibiotic treatments. They also actively stimulate the immune system by decreasing children’s susceptibility to infection and allergies (rhinitis and rash). This type of lactic acid bacteria, originating from Bulgaria, are known for their beneficial properties, worldwide. The daily intake of L.bulgaricus results in reducing intestinal infections and putrefactive proceses through the production of acids, which decrease acidity in the gastrointestinal tract. L.bulgaricus contribute to improving the absorption of dairy products and production of natual antibiotic substances, which selectively suppress the development of pathogenic bacteria. Furthermore, L.bulgaricus stimulate children’s immune systems and protect and neutralise toxins and free radicals in the body. One of the most important probiotic functions of S.thermophilus is associated with alleviating symptoms of various gastrointestinal disorders. S.thermophilus is effectively involved in the process of breaking down lactose (milk sugar). In those suffering from lactose intolerance, taking S.thermophilus considerably helps treat this condition through the production of a significant amount of an enzyme called lactase, which breaks down lactose. S.thermophilus also has a powerful antioxidant action, protecting the body against free radicals resulting from stress, the intake of antibiotics, and other chemicals and toxins. Furthermore, S.thermophilus has an anti-tumor action, preventing nitrates from turning into carcinogenic compounds. These populate any balanced digestive system. Bifidobacterium bifido maintain healthy intestinal microbial flora, control and suppress the development of pathogenic bacteria, support digestive processes, and boost the immune system. These beneficial bacteria produce an acid that prevents the development and colonisation of pathogenic microorganisms. They play a major role in the correct functioning of metabolism and digestion of children. B.infantis restore intestinal balance and help in cases of bloating, gas accumulation, diarrhorea, constipation, and stomach discomfort. These restore gastrointestinal flora damage due to antibiotic treatment and after infections associated with Crohn’s disease or colitis. This strain of bacteria produces organic compounds which increase acidity in the small intestines and prevent harmful bacteria from populating it. B.longum support children’s immune protection functions and help prevent inflammatory processes, allergies, constipation, diarrhorea, and lactase deficiency. The human digestive system hosts more than 1,000 types of bacteria which are part of the normal microbiota. 1. Pathogenes - which are harmful. 2. Conditional pathogens, - which under normal conditions are not able to cause disease but become pathogenic when immune protection is impaired. 3. Beneficial - which have useful effects on the body. The ratio of these groups of microorganisms conditions normal functioning of the gastrointestinal tract and immune system and, consequently, human health. Today, about 70% of the global population needs some correction of intestinal microbiota. Why is Lactoflor Kids the Ideal Product for Children? The stomachs of children struggle with new foods and a number of bacteria, viruses, microorganisms, and medicines. With care for children, Kеndy Pharma has developed Lactoflor Kids - a special probiotic formula which efficiently aids in gastrointestinal problems in children. Lactoflor Kids is enriched with a prebiotic component (oligofructose, the food of good bacteria), which is a natural source of fibre that facilitates digestive processes. 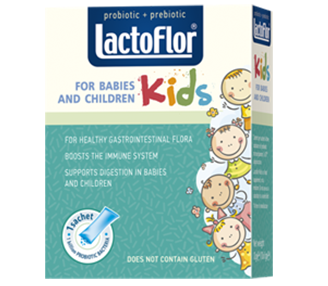 Lactoflor Kids is exceptionally easy to use—simply dilute with water or milk. It is colourless and taste-free. Our ultimate health begins in our stomachs, and Lactoflor Kids is a trusted aide for children’s stomachs. While caring for children’s health is comprehensive and does not entail the intake of probiotics only, probiotics provide an exceptionally strong support for the natural immune system of children and their appropriate development from an early age. Dr. Yordan PopovDr Dimitar AngelovZdrave Integrated Hospital for Active Treatment OOD, Pulmed Hospital, Plovdiv, Bulgaria. Zdrave Integrated Hospital for Active Treatment OOD, Pulmed Hospital, Plovdiv, Bulgaria. • Resistance to stomach pH. • Belong to normal GIT inhabitants. • Be resistant to antibiotics. • Ability to suppress the growth of pathogenic bacteria and/or viruses. • Restore and maintain the balance of gastrointestinal microbiota. Probiotics and probiotic-based products have now taken their well-deserved place in health care, both as adjunctive therapy with antibiotic treatment and as agents used in treating a number of conditions, including IBS, IBD, polychemotherapy implications, antibiotic-associated diarrhoea syndrome, necrotizing enterocolitis, and travelers’ diarrhoea. These products are also used in the reconvalescent period after infectious and viral gastroenterocolitis. In addition, according to most recent publications, probiotic products aid in eradicating H. pylori (based on the biological principle of competition). .
Probiotics contain various microbiological strains of microorganisms that normally exist in our GIT, including the most common and popular ones: Lactobacillus acidophilus, Bifidobacterium bifidum, Lactobacillus casei, Bifidobacterium longum, Lactobacillus rhamnosus, Bifidobacterium infantis, Streptococcus thermophillus, and Lactobacillus bulgaricus. If used properly and regularly and stored appropriately, probiotics are very efficacious in treating and preventing a number of diseases, mostly gastrointestinal tract disorders. (Journal of Clinical Bacteriology, NY, 2010). In this context, we would like to share our clinical experience in the administration of probiotics. According to WHO (World Health Organization), irritable bowel syndrome (IBS) accounts for some 40% of the cases in gastroenterologists’ routine practice. (Ann J of Gastroenterology, WHO, Geneva, 2012) Administering probiotics in IBS patients has become an established standard in day-to-day medical practice. According to WHO (Ann J of Bact Deseases, WHO, Geneva, 2012), antibiotic-associated dysbacteriosis and diarrhea syndrome account for 25-28% of functional gastrointestinal disorders. From 01 June to 01 October 2013, 87 patients with IBS were referred to our clinic. Single probiotic therapy was recommended to 70 patients. During follow-up visits, a clinical effect was reported in 60 patients, such results as improved self-image, discontinued bloating, lack of gas and flatulation, regular physiological rhythm in bowel movements. Double therapy was recommended to 17 patients—6 patients received probiotics and concentrated and standardised extracts (via gelatine capsules), and 11 patients received Simethiconе. A clinical effect (in the above indicators) was observed in 14 patients. The data presented above support the routine administration of probiotics as a monotherapy and their administration in combination with other drugs influencing gastrointestinal motility and adsorption and evacuation of gas that is produced in larger amounts in specific functional and fermentation-associated GI disorders. From 01 August to 01 October 2013, 23 patients with antibiotic-associated dysbacteriosis and diarrhoea syndrome were referred to our clinic. It was concluded that 12 of these patients had classic antibiotic-associated diarrhoea syndrome, resulting from antibiotic treatment for pulmonary pathology and upper respiratory tract pathology. These patients were treated with a probiotic monotherapy. An effect (in the above indicators) was reported in all 12 patients. The remaining 11 patients received combination therapy, including a probiotic product and Otilonium bromide. A clinical effect (in the above indicators) was observed in 10 of these patients. The above data convincingly demonstrate the effect of administering probiotic agents in routine clinical practice. 1. In the group of 87 patients with IBS, probiotics (manufactured by Kendy Pharma) were prescribed to 56 patients. An effect was reported in all 56 patients. (Effect means that a response was observed in at least two of the aforementioned indicators.) 2. In the group of 23 patients with antibiotic-associated dysbacteriosis and diarrhoea syndrome, probiotics (manufactured by Kendy Pharma) were prescribed to 20 patients. An effect was reported in 17 patients. 4. Probiotics manufactured by Kendy Pharma are reliable products. There have been no reports of any adverse effects that could be associated with the intake of this type of probiotics. Dr Vasil RankovTsar Boris III National Integrated Transport Hospital. Tsar Boris III National Integrated Transport Hospital, Sofia, Bulgaria. 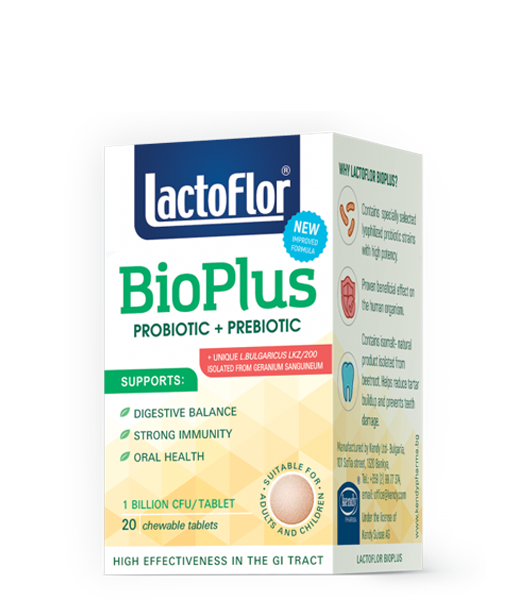 Lactoflor BioPlus is a proprietary probiotic combination containing only natural ingredients, including two unique strains: Lactobacilus bulgaricus and Streptococcus thermophilus. The fibers (inulin) added to the combination of Lactoflor BioPlus cleanse the body and support digestive processes, as well as the activity of beneficial bacteria. 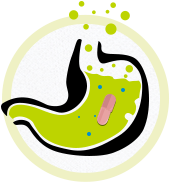 Lactoflor BioPlus is particularly appropriate in a number of gastroenterological and hepatological pathologies observed in patients referred to our clinic. Lactoflor BioPlus is also applicable in patients after chemotherapy, radiation therapy and post-operative recovery. • Inflammatory disease of the lower gastrointestinal tract, with various pathophysiologies, such as IBD, Crohn's disease, ulcerative colitis, and irritable bowel syndrome. • Adjunctive therapy for Helicobacter pylori eradication. 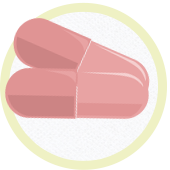 Lactoflor BioPlus should be taken 1 to 3 months, depending on the patient’s condition and disorder. The combination of lactic acid bacteria and fibers improves and conditions the functioning of the stomach, small intestines, and colon. It also improves peristalsis and leads to normalising the functional condition of the gastrointestinal tract. Lactoflor BioPlus can be administered (at physician’s discretion) in post-operative periods for quicker recovery of the functioning of the small intestines and colon, which results in more rapid recovery and reduces post-operative complications. • Increases the body’s absorption of proteins, fats, and P, Ca, Fe. • Enhances stability of vitamins В1, В2, В12. • Stimulates release of digestive juices. • Regulates the function of the gastrointestinal tract. • Strengthens the body’s resistance against contagious diseases. • Mitigates milk sugar intolerance. • Reduces amount of cholesterol and ammonia in the blood. • Suppresses development of harmful organisms in the gastrointestinal tract. Dr K. PetrovClinic for Metabolic and Endocrine Diseases and Dietology, Tsaritsa Yoanna ISUL University Hospital, Medical University, Sofia, Bulgaira. Clinic for Metabolic and Endocrine Diseases and Dietology, Tsaritsa Yoanna ISUL University Hospital, Medical University, Sofia, Bulgaria. The main properties of live organisms include feeding, breathing, movement, and reproduction, strongly influenced by technology and industrialisation. Those that are most affected include such high-risk groups as premature babies, infants, and children. Feeding and nutrition are among the first and most important interactions of the body with its environment. The Joint FAO/WHO Expert Consultation on Evaluation of Health and Nutritional Properties of Probiotics (October 2001) defined probiotics as ‘live microorganisms which, when administered in adequate amounts, confer a health benefit on the [human] host’ (1). Experts’ consensus on this definition was based on the increasing number of scientific reports of health professionals, indicating that food with added live probiotics has beneficial effects on human health—in particular, live probiotics added to milk products have beneficial health effects on children and other high-risk populations. Data resulting from scientific work have suggested that probiotics play an important role in immunological, digestive and respiratory functions, and could have a significant effect on the alleviation of infectious disease in children. Evidence in the research of health professionals prior to 2001 provoked more comprehensive studies of the effects of probiotics—studies which continue in order for data to be extrapulated to the entire population and separate high-risk groups. The most substantial research development was observed in the field of gastroenterology, with the effects of probiotics on the function of the GIT, the management of chronic GIT disease, and the function of the immune system mediated in the GIT. This research resulted in the creation of the guidelines of the World Gastroenterology Organisation in May 2008 (updated with current data in October 2011). The section entitled Probiotics, Prebiotics, and Evidence—the Global Picture (editions of the 2008/2011 guidelines) presents evidence concerning the genera, species, effects, number of references, and evidence level. Lactoflor Kids is a synbiotic mixture which contains a prebiotic component (oligofructose) and seven probiotic types of bacteria. Four of these types (L. helveticus, L. acidophilus, L. bulgaricus, Str. thermophilus) belong to the genus of lactic acid bacteria (LAB), and the other three (B. bifidum, B. infantis, B. longum) belong to the Bifidobacterium genus, which also produce lactic acid. Oligofructose is a nutrient that can be absorbed by these seven probiotic species. This nutrient aids in the increase of the number of probiotic bacterial cells, thereby potentiating the predictable beneficial effects. Table 1 (below) shows the effects studied in various clinical conditions in children, the number of references, evidence level, and recommended daily dose for each probiotic species contained in Lactoflor Kids, including probiotic combinations. 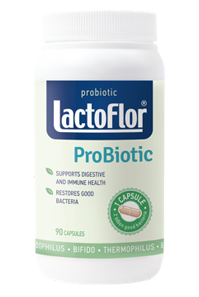 The order of probiotics presented below does not favour any of the species contained in Lactoflor Kids. The data in Table 1 (below) are based on the 2008/2011 guidelines of the World Gastroenterology Organisation. • Treatment of acute infectious diarrhoea. • Prevention and treatment of antibiotic-associated diarrhoea. • Prevention and treatment of nosocomial infectious diarrhoea. • Prevention of necrotizing enterocolitis in prematurely born babies. • Stomach bloating and gas. • Weakened immunity with seasonal changes. • For children 6 months to 2 years old: 1 sachet daily with meals. • For children 2 to 12 years old: 1 sachet twice daily with meals. is enriched with a prebiotic component (oligofructose, the food of good bacteria), which is a natural source of fibre that facilitates digestive processes. The stomachs of children struggle with new foods and a number of bacteria, viruses, microorganisms, and medicines. With care for children, Kеndy Pharma has developed Lactoflor Kids—a special probiotic formula which efficiently aids in gastrointestinal problems in children. .
Lactoflor offers a full range of combined synbiotic products (prebiotics and probiotics) that contain selected strains of lactic acid bacteria, including Lactobacillus delbrueckii ssp. bulgaricus (Lactobacillus bulgaricus) and Streptococcus thermophilus, Lactobacillus acidophilus and Bifidobacterium ssp. Lactoflor is available in chewable tablets, capsules, or soluble sachets for children. 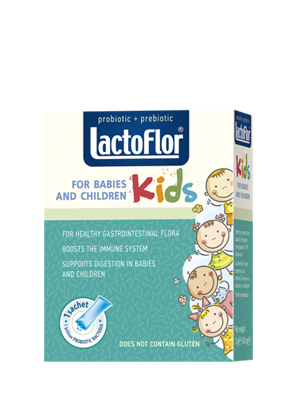 Lactoflor Kids contains seven strains of lactic acid bacteria, as well as fibers, developed especially for babies and young children—strains which help boost children’s immune protection and digestive system. Lactoflor Kids alleviates symptoms of lactose intolerance and helps prevent and stop diarrhea symptoms. 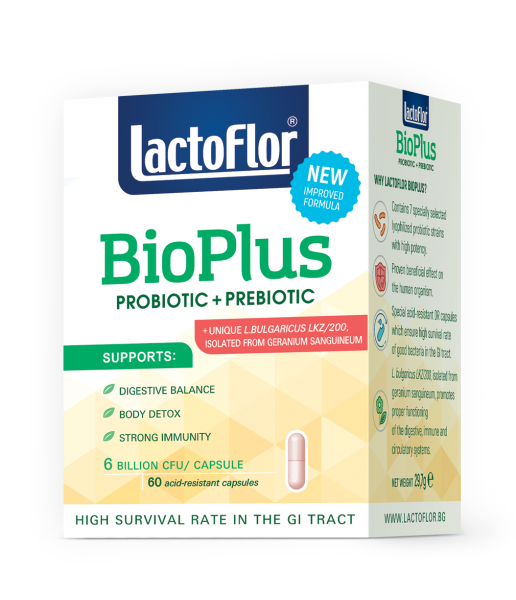 Lactoflor BioPlus Chewable tablets are a special probiotic combination containing three strains of probiotics, prebiotics (inulin), and fibers. It comes in caramel flavour, yet sugar-free and free of artificial sweeteners or flavours. Lactoflor BioPlus Chewable tablets alleviate gum inflammation and prevents the formation of dental plaque by fighting harmful bacteria in the oral cavity. In addition to a combination of four unique types of lactic acid bacteria (Lactobacillus bulgaricus, Lactobacillus acidophilus, Streptococcus thermophilus, and Bifidobacterium sp. ), Lactoflor BioPlus also contains fibers (inulin) which cleanse the body and support digestive processes, as well as the function of good bacteria. Contains only natural ingredients and includes four unique types of lactic acid bacteria: Lactobacillus bulgaricus, Lactobacillus acidophilus, Streptococcus thermophilus, and Bifidobacterium sp. Supports the functioning of gastric and intestinal flora impaired by intestinal infections and antibiotic treatment and improves the immune system. 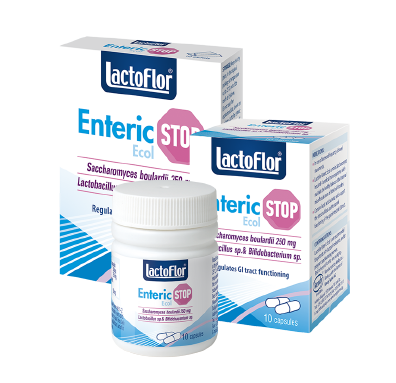 Lactoflor Enteric Ecol is a probiotic product containing Saccharomyces boulardii (microorganisms which stops diarrhea in a natural way), as well as lactic acid bacteria (which restore the functions of intestinal flora). 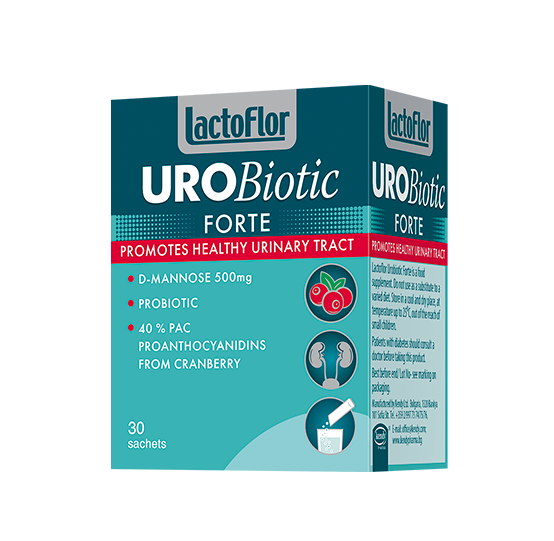 Lactoflor Urobiotic is a powerful formula for managing and preventing infection, with three active ingredients which contribute to normal functioning of the urinary tract. 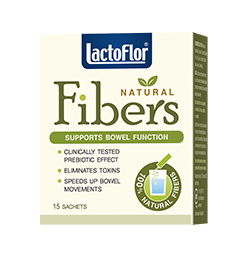 Lactoflor Fibers is a natural product which supports normal bowel function, increases frequency of bowel movement, and detoxicates the body. 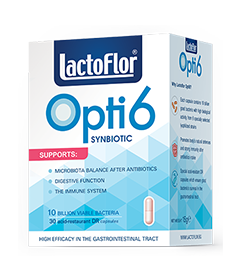 Lactoflor Opti6 is a new-generation synbiotic containing six types of lactic acid bacteria* with high biological value and prebiotic (inulin), which improves digestive processes.